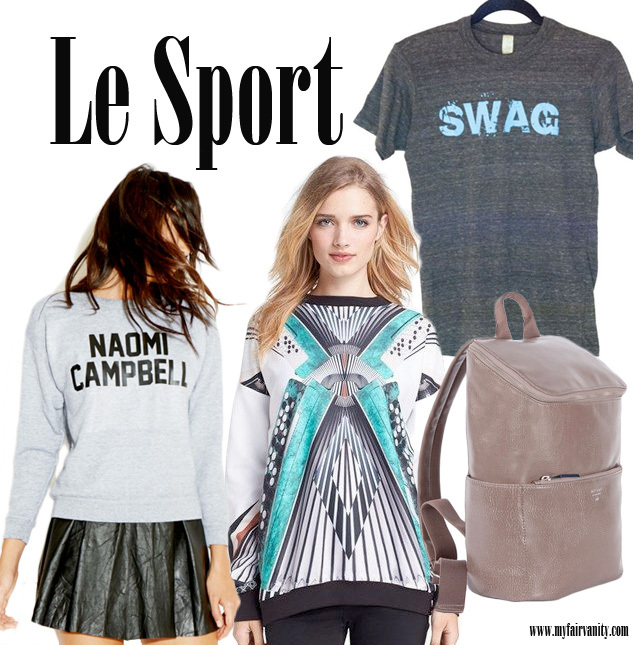 I'm kind of loving all of the sporty, athletics-inspired options for fall, ya'll! I don't really enjoy watching sports and I find the gym intimidating, but I do love sweatshirts. Because who doesn't love sweatshirts? Especially sweatshirts that are now considered "fashion-y." This style moment may be fleeting, so I recommend we all take full advantage as quickly and comfortably as possible. Any shirt emblazoned with badassical words like "SWAG" or "Naomi Cambell" is a shirt for me. The Naomi sweatshirt is by one of my new faves, Reformation, a rockin label I discovered on Ecocult. Reformation is an environmentally sustainable fashion brand that repurposes vintage and surplus materials to create limited edition collections. Each collection is made locally in their New York and Los Angeles studios and then sold directly at their stores, so prices are pretty reasonable. It's basically an eco-friendly version of Nasty Gal. P.S. the adorable skirt the model is wearing is made of upcycled vintage leather. The insane acid trip sweatshirt is (of course) by my new favorite insane acid trip designers, Clover Canyon, who make all of their crazy awesome items in California. THESE SHORTS ARE STILL AWESOME. Lastly, I had to include this beautiful taupe backpack by Matt & Nat because it's not only perfectly sporty, but also very sleek and modern. In general, I'm vehemently opposed to backpacks, but if I had to wear one, I would definitely wear this one. Like all Matt & Nat products, it's vegan and the interior is made from recycled components. In the slideshow below, I've put together even more sweatshirts for you, and each and every one is made in the USA, which will, I hope, justify the fact that not one of them is under $100. Womp womp. But this one from American Apparel is only $40 and comes in 13 colors! in my new store section!